I was just curious…what does a child call their father/mother’s female and male cousins? Is it the same as their father/mother’s siblings? I had heard like 10 years ago, I should call my mother’s younger brother’s wife (phew) “weh-zing-mo” to her face? So now I should call her “sookmo” instead, to be more modern? Am I old-school saying “weh-zing-mo”? weh (외) is the maternal part of the phrase. Although the OP said we don’t include 외 when directly speaking to the aunt, my husband always calls his aunt the full term: 외숙모. I feel that almost all Koreans use 외 even in direct address for this relationship. The zing pronunciation is a bit uncommon, but I can see where that pronunciation comes from. In 숙모, when the ㄱ meets the ㅁ, the ㄱ makes an /ng/ sounds (like ㅇ, if you are familiar with korean pronunciation). Also, the ㅜ sound is often softened to something closer to an ㅡ sound, so that the pronunciation is often similar to 외승모 which is actually quite similar to the weh-zing-mo you’ve spelled it as! Korean doesn’t have a /z/ sound, so I imagine that the /z/ is actually meant to be an /s/ sounds. weh-seung-mo is the closest romanization to how many Koreans pronounce this term! I think that the explanations of 애비 and 애미 is bit improper. first, actually 애비 and 애미 aren’t standard languages. (though they are widely used) the standard languages are 아비 and 어미 (or 아범 and 어멈 with bit respect for the person who called). they are used when you, who married and has child, have to call your husband or wife in front of elder person (usually your parents and your parents-in-law) or when you call your son who has his child (so your grandchild) in front of younger person then you (usually that son or that son’s wife) and your son’s wife (also has her child, so your grandchild) in front of younger person then you (usually the very son or that very son’s wife). OR when you mention anybody who has child without ANY respect, bit rudely. thank you for the information! this was very helpful. i was wondering what drama the first picture is from? so I know that if you are a girl and have 2 older brothers the prefix for the eldest is Keun Oppa (큰오빠) and then the second eldest brother is to be called Jageun Oppa(작오빠). Is it the same for a guy i.e. Keun Hyung (큰형) and Jageun Hyung (작형)? Also if you have 4 elder brothers, then how are you to refer to them? Will it just be (큰큰큰큰오빠/형) [Keun Keun Keun Keun Oppa/Hyung]? 1 – Yes, the same applies for guys when they are addressing their older brothers. 2 – The younger siblings will refer to the older siblings according to their order in the family, like the eldest brother/sister being ‘keun’ (큰) 형/오빠/누나/언니, second being ‘duljjae’ (둘째) 형/오빠/누나/언니, third being ‘setjjae’ 셋째, fourth being ”netjjae’ 넷째, and so on. I’m writing a book set in Korea and you literally just saved my but. I’m not planning to use a ton of korean name terms, (at least not in the first draft), but this is SO helpful. 1 ) Why does the spelling differ so much depending on what site you are looking at? 2 ) Any advice on referring to your boss/assistant/other posts? 1) The difference in spelling could be due to the romanization system adapted by the writers. Research papers and books usually use the much older McCune–Reischauer while only few have adapted the newer Revised Romanization of Korean. Bless you! And thank you so much. What do you call the spouse of your cousin? My son who is European is married to a glorious Korean lady. What do I call her mother in Korean? Most likely “an sadon” (안 사돈). The accent would be on the “an” syllable. Actually it’s already tackled up there, I just saw it awhile ago. It’s most likely “an’sadon” (안사돈), the accent would be on the “an” syllable. If she’s older it would be “sabu’in eoreun” (사부인 어른), or simply “sabu’in” (사부인). Sorry for the late reply. Even if those are the case, the terms used will still follow the order in the family, not the age. For instance, if you’re a man, your younger sister’s husband will still be called maeje, and your husband will still be the maehyeong to his brother-in-law. Thank you so much!! I’m writing a book where one of my main character is Korean and I’m trying to figure out what a loving mother would call her son. Is there a certain word a mother would typically use that would be sort of like ‘honey’ as a word of endearment? As for your question, a mother would usually call her son by name, or more intimately, using their order of birth, like 막내 maknae (the youngest). If the son is still young, he might be called 아가 aga (baby). The nicknames usually change with age. Thank you! What would he be called if he’s the middle child out of three? In conversational terms, it’s usually “(friend’s name)’s mother”. Example: your friend is named Dong-min (동민), your mother will call his mom “Dong-min’s mother” (동민이 어머니 Dong-mini eomeoni). Even among acquaintances (since they’re not strangers but not that close), direct personal name taboo still applies (even if the mothers know each other’s names), unless they’re being upright confrontational. On another note I noticed you wrote “oppa” as for older brother, but that term can also be used to call your boyfriend. So what if a girl’s boyfriend and older brother are in the same room 🤔? My older female 1st cousin had a baby. What is our chon, and what can I call the baby? My paternal grandmother’s brother (forgot if younger or older) has a daughter that I basically call “aunt” (despite the huge age difference between her and my father). What is our chon, and what is the Korean term I can call her? I worked for a Korean older couple for many years. I started when I was 17. They became like parents to the point where the husband would ask me where my ama was. I moved out of state and still keep in touch every so often. I have been learning Korean for 1 year already and wanted to send her a card for her upcoming Birthday. How would I address her? I was going to say eomoni but since she has 3 sons I don’t want to come off as a daughter in law, that would be very awkward being that I am married lol. Any advice would be helpful! IMO “eomoni” would still be the best choice. …unless of course she herself verbalizes otherwise. In my family, we call our grandparents’ siblings 이모 할모니, 고모 할모니, etc. My grand niece is only 4 months old, but I can’t wait to hear her say 이모 할모니. We also call most of our blood uncles 삼촌. And, we also consider our cousin’s children our nieces and nephews and they consider us uncles and aunties. My extended family is really close. Fyi…I am a Korean born US immigrant. My family came to LA in the early 80s. You explain all the confusing things in KDramas well. 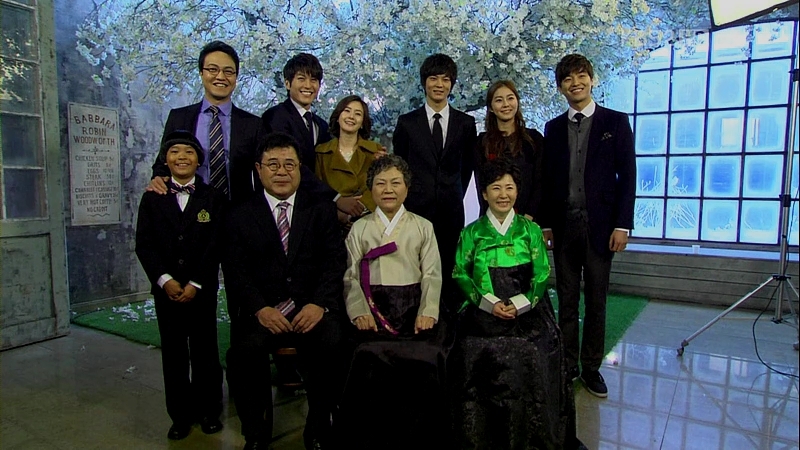 My friend suggested me to watch Nam Jihyun’s ‘What Happened to My Family’. I like that drama a lot. What a heartwarming drama. Your explanation match what they said in the drama. I just don’t really get it when Kang Seoul addressed Cha Gangjae as Gangjae Hyungnim. rd781 calling someone hyungnim is a sign of high respect. NIM is added to names and pronouns to designate a higher level or respect. My younger male cousins and big brother (all older than me) refer to my oldest male cousins as hyungnim and our oldest female cousin as noonim. I have had younger coworkers refer to me as sunbaenim, noonim, and dong joo-nim. Normally, you would refer an associate or someone you don’t know very well as their name with a ‘ssi’ at the end. HOLY MOTHER OF THE PATRIARCALIST LANGUAGES OF INFINITES WORLDS. Thank you so much for this article. My wife’s family has really included me in the family and as a Westerner they generally like me to use family titles over in-law titles. Her mom liked me calling her ‘eomma’ and I call her sister ‘noonah’. I call her brother ‘hyung-nim’ but that is both the older brother and the in-law title anyway. I actually call my son from another marriage ‘adul’. Not living in Korea it can be hard to remember the titles so I practice any chance I get. This article is a great reminder so thank you.